NewUrbanStreets | Sharring experiences in urban infrastructure delivery. Sharring experiences in urban infrastructure delivery. 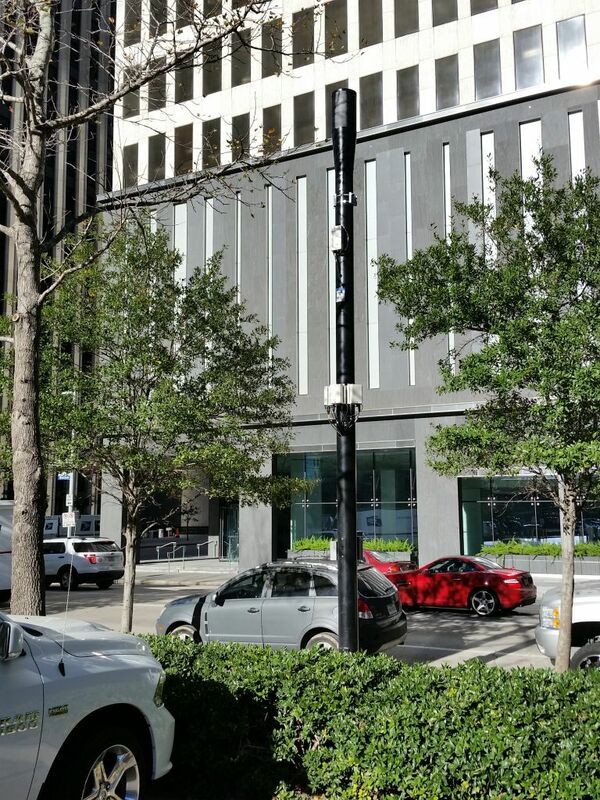 This post is intended to provide an overview of the regulatory scenario developed by the City of Houston Texas for the addition of mini-cell towers in the rights of way. With Super Bowl 51 several years in the future, those of us that work with Rights of Way (ROW) infrastructure and economic development began hearing of the plans by broadband carriers to install mini-cell towers in the rights of way in high bandwidth demand areas and those projected to be a high demand area. The permanent mini-towers they wanted to install overlapped to some extent with the temporary COWs and NOWs brought in for SB51. 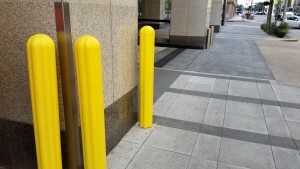 This post will focus on the permanent installations. 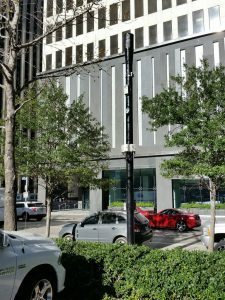 Houston, especially in the downtown area, has a vivid memory of the crazy initial fiber optic installations of the late 1990s to about 2005. The fiber installers should up in the early evening and began directional boring and often digging up the street. Loose plates were found the next morning over the new holes and a week or so later the sloppy patch was falling apart and a pot hole grew wider by the day. That was not to happen again. Additions to Chapter 40 of the Code of Ordinances was crafted with industry input. Click here to read it. A great deal of thought was quickly included in it by various departments in the city who have duties in the ROWs. The final changes included involving the management districts and tax increment reinvestment zones (TIRZ) who were pursuing particular streetscapes and a generic galvanized pole with and box (antenna) on top would be a detraction to the public’s investment in the streetscape. The 700 block of Walker St.
Notice the ordinance establishes procedures intended to drive the telecom providers to those entities to work out locations and looks that would support the areas. You will also note those entities did not have rejection rights as the decision-making authority remained with the City. But, if the providers wanted a quick City approval then getting the required written position statement from those entities would make for faster City approval. Also, note the ordinance anticipated that those entities would have published Design Standards for the telecoms to reference. In all cases, those standards had to be codified. The various standards did prove useful although since they did not establish a level of care that was the basis for an approval they did not carry a lot of weight. The ordinance is intended to allow the telecoms their rights to use the ROW while the City protects the public’s investment in the infrastructure and ability to use that investment. Plus, allow the two neighborhood and business related governmental entities input to the process so their investments are not damaged. How did it work out? Well, the process was not without bumps along the way. But, so far, there are not any horrible installations (in this writer’s opinion) and there were no reports during SB51 of guest’s frustration with low bandwidth. A COW in a parking lane on Walker St. at Smith St. Given that the tech side of our society loves acronyms, the positioning of COWs in Houston for SuperBowl 51 (SB51) was discussed in meetings with at least a few snickers and rolling eyes. 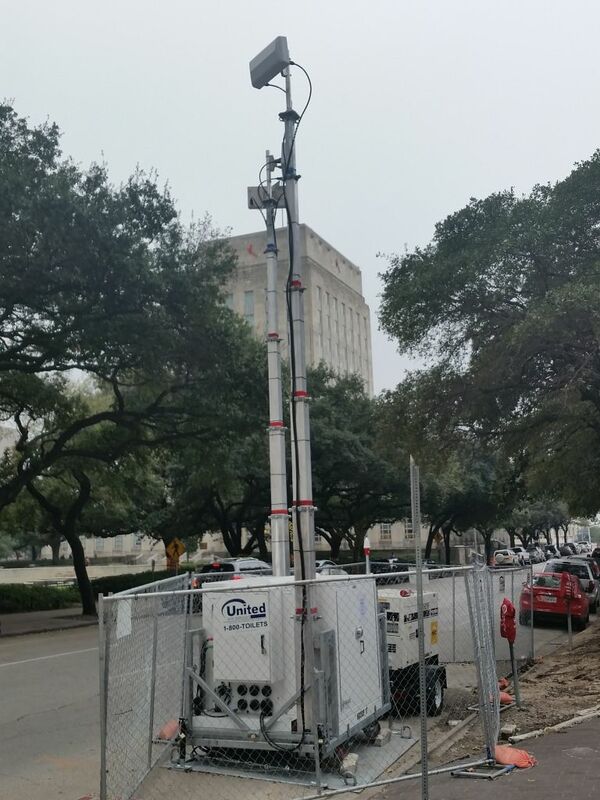 The Cell-on-Wheels (COW) is a temporary telecommunications package used to boost connectivity when a special event will call for a large increase in bandwidth capacity. 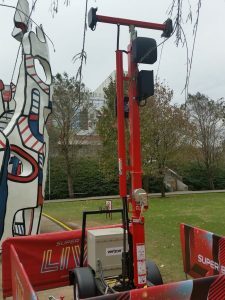 Two different installations types were used in downtown Houston for SB51. The one with only the chain link fence enclosure shown here is in two parking spaces. The more attractive red installation is in Discovery Green park across the street from the NFL Live events in the George R. Brown Convention Center. Those that leased parking spaces were equipped with their own electrical generator. Repeater in Discovery Green park. Even though both are temporary installations they are included here to share our experience with how the telecom industry met the high bandwidth needs of a special event when hundreds of thousands would be accessing their smartphones. They had also installed permanent mini-towers around Discovery Green but still deployed the repeaters. There was always the question in my mind if the devices were repeaters (expanding service range but not bandwidth) or truly an additional broadcast point with a feed from a fiber optic cable. The reps I talked to said they would have connections to the fiber where possible. I doubt that many did as that would have required installing a conduit into a vault under the street. I personally did not see any locations where that had occurred. Neither of the two setups in the photos here had a connection to fiber under the street and there is no overhead in this part of downtown. We also heard similar setups referred to as NOWs; i.e. Node-on-Wheels. 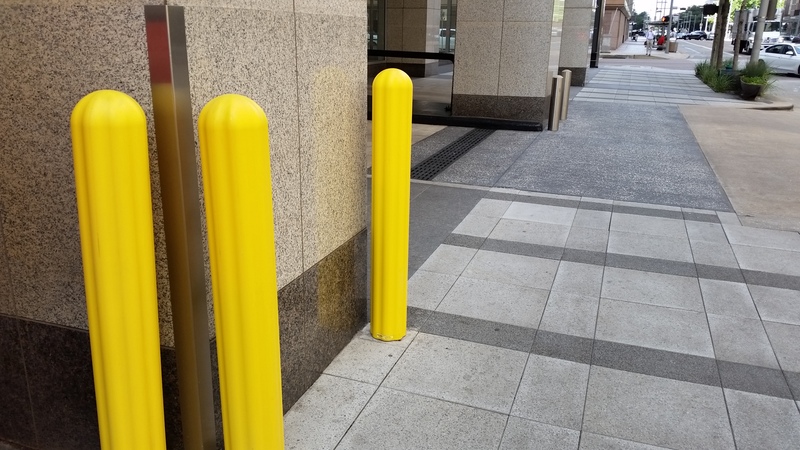 This post is not made as though it is day-lighting a new add-on to the old, tired, scared bollards. The intent is to show that the plastic sleeve can be a good solution and is chosen by owners of major high-rise, class A buildings. The sleeve certainly cleans up the dock entrance and makes it look far less like a war zone. 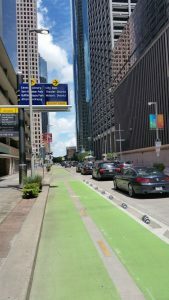 The City of Houston’s Department of Public Works and Engineering converted a parking and vehicular lane to a dedicated bike lane as you see here. The lane is “isolated” from the vehicular lane by the long stripped dome shapes that we Texans–not surprisingly–call armadillos. 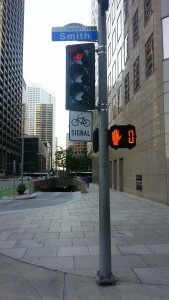 Note the special signage as well as the special traffic signals for bike riders. Look closely at the red lens as it shows a red bike rider. I also noticed at one intersection it appeared the bike signal turned green ahead of the vehicular green signal by several seconds. My traffic engineering buddies would call that preemption to allow the bike rider to get into the cross street before the cars start. 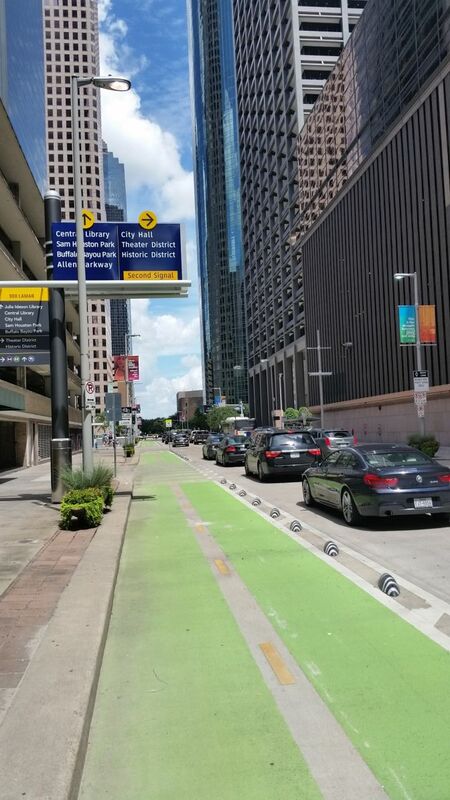 You can see the lane on Dallas St. in downtown Houston. Click here to see a one-page paper about the lane, how it fits in the street and a location map. How well they work will be interesting to watch. 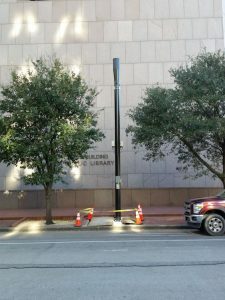 This blog is a collection of articles about things I, Tom Davis, or others have built in downtown Houston Texas, what we learned and issues we faced. The hope is you will pick up ideas and tips from that process to allow your urban revitalization to benefit from these experiences. If you are a Houstonian or visiting be sure to go downtown and experience the best public space in the city. Let me know what you think and any ideas to make it better. This blog is a personal effort and is not endorsed by anyone or any organization. Please read the Credits page. Register and you will be sent an email when a new post is published. Your email address will not be shared or sold. See Site Admin below to Register.